Listed in the 2018 World Monuments Watch, the ‘Potager du Roi’, the kitchen garden created 340 years ago for Sun King Louis XIV in Versailles Palace, France, has an opportunity to design a new form of gardening aesthetics to produce the fruits and vegetables sovereigns would dream to have on their table. 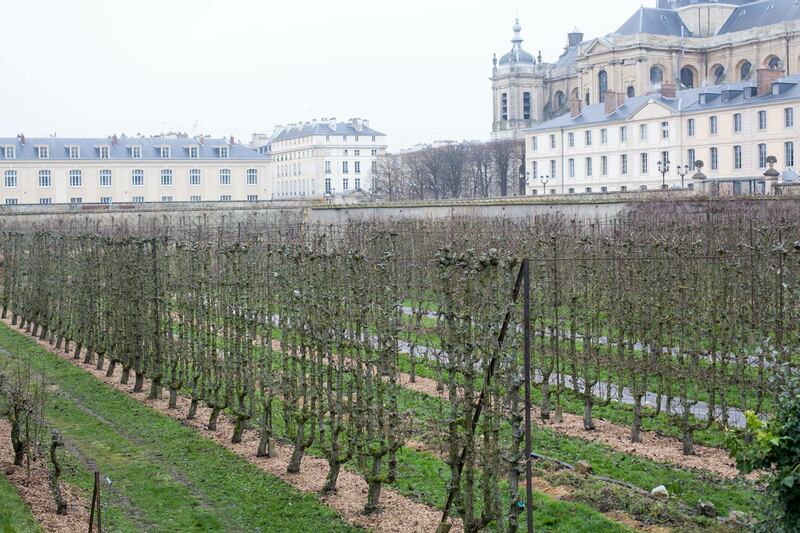 The ‘Potager du Roi’ is located in the city of Versailles, France. Photo 2 December 2017. My visit to the ‘Potager du Roi’1 in Versailles during the first weekend of December 2017 lived up to my expectations. 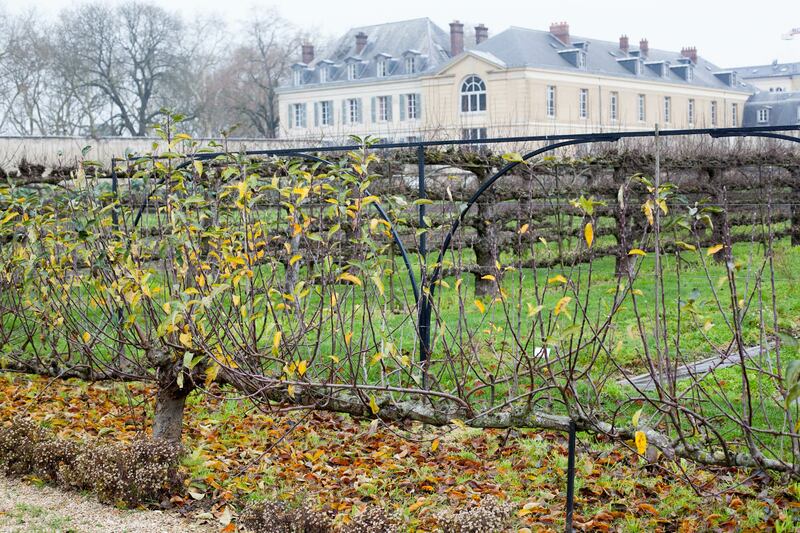 After walking through the vast 23-acre kitchen garden where I took pictures of the suntrap walls that enable fruit to better grow and shapes of trained trees, I was lucky to meet its Director Antoine Jacobsohn at the entrance of the figuerie, one of the places where Jean-Baptiste de la Quintinie, who created the garden between 1678 and 1683 experimented with the horticulture techniques of his time. The figuerie, the yellow building, became an educational space and was added a floor at the beginning of the 20th century. Hundred-year-old ‘contre espaliers’ pear trees. 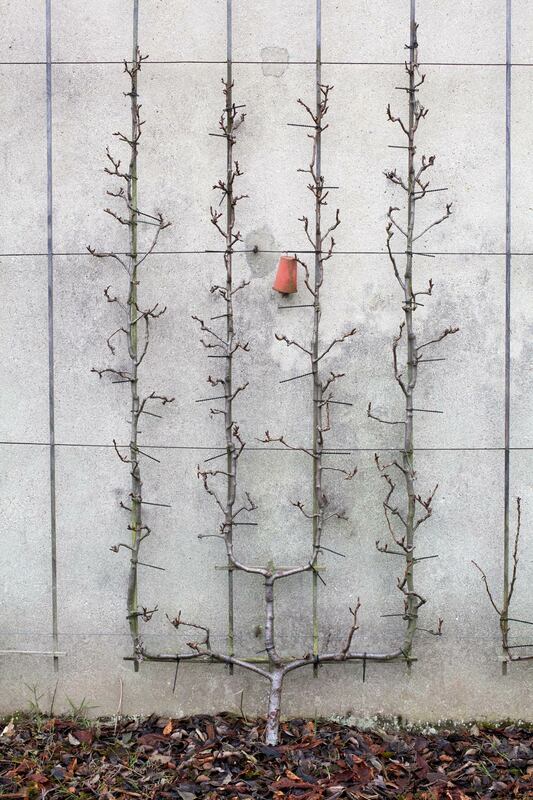 68 tree shapes are formed and pruned for better fructification by the expert gardeners of the Potager. While we walked through the alleys, I learnt about the history of the place and its recent developments. As a trustee of an organisation advocating for the biodiversity of fruit varieties and the development of agro-ecology, I was particularly interested in the permaculture experiment. This involves a move from monoculture, practised in some parts of the garden alongside entire walls planted with a single fruit cultivar and nothing else, to more diverse ecosystems more capable to defend themselves against pests and diseases. Mr. Jacobsohn and I went to the Potager’s shop and offices, where we discussed horticulture literature, education and our tastes in food. I was pleased to realise that the Director of the Potager is familiar with an American book I consider an essential resource for understanding the development of horticulture in Paris from the 16th century onwards and envisaging its future today. Food in the City – Histories of Culture and Cultivation, published by Dumbarton Oaks in 20152, is a book we will come back to in another article of this blog. It includes in particular two articles of interest in relation to the ‘Potager du Roi’: Paris is a Land of Plenty – Kitchen Gardens as Urban Phenomenon in a Modern-era European City (Sixteenth through Eighteenth Centuries) and Market Gardens in Paris – a Circulus Intelligent circa 1790-1900. A must read in my view for anyone involved in the development of a new vision for the site. 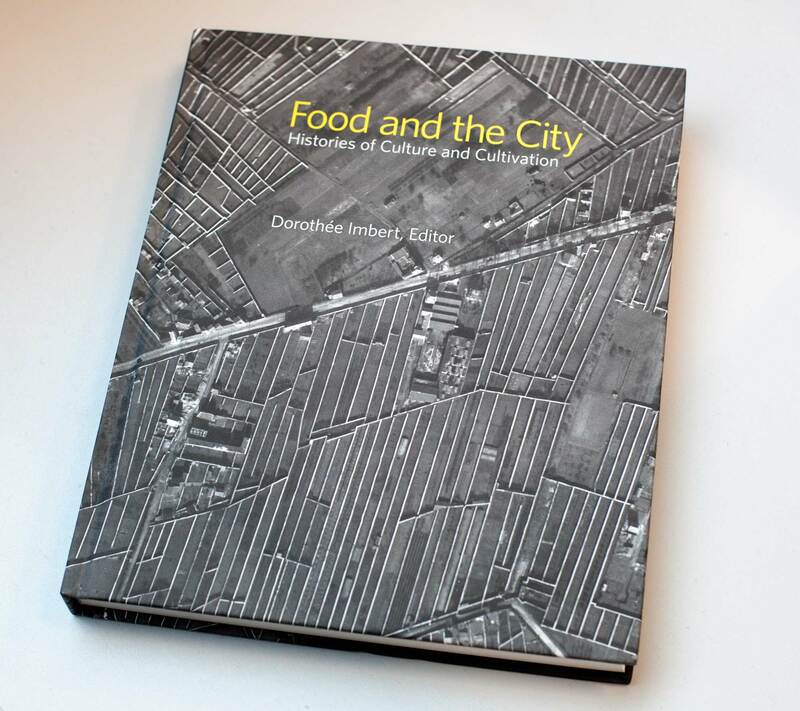 ‘Food and the City explores the physical, social, and political relations between the production of food and urban settlements’2. Photo 6 December 2016. The education part of our conversation is the only moment when I felt Antoine Jacobsohn actually learnt something from me. I described the compote-making training experiments we conducted at La Plantelière in Aurillac, France, using small apples we didn’t peel. It naturally led to the question of tastes in food. It became obvious that we shared a deep common interest in its preparation and consumption. I will soon publish a slow-stewed apples recipe in this blog, inspired by Antoine’s own technique. After our meeting, I went to a local ‘salon de thé’ where I tasted a ‘Marie-Antoinette’ tea delicately flavoured with Canada Blanc apples from the Potager. This is where I started to think that the common thread in these 340 years of history of le ‘Potager du Roi’, what has kept it alive for so long when some other kitchen gardens of princely residences just disappeared, was primarily food. Should the ability to produce exceptionally high quality food, of a royal level, be the main driver for the Potager’s regeneration project? The argument also stemmed from a comparison between the two orchards created in the second half of the 17th century by two of the most powerful European political figures of their times, Prince-Bishop of Olomouc Charles II in Kroměříž, Moravia, Central Europe, and Sun King Louis XIV in Versailles, France. Both Kroměříž and Versailles palaces were built to manifest the power of their sovereigns, and both included an orchard designed to display the best arboriculture techniques of their times. However, visiting both places in the last quarter of 2017 left me with very different feelings about what the orchards might become in the future. 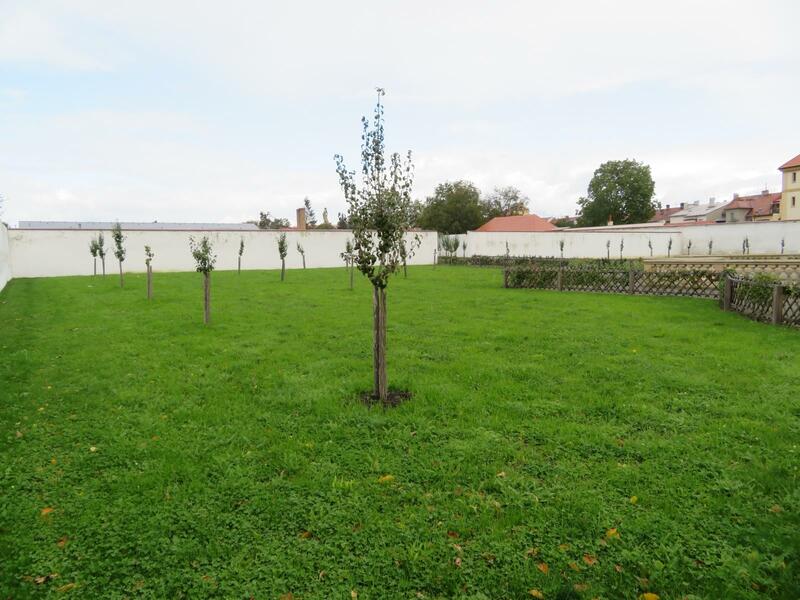 The orchard in Kroměříž’s Pleasure Garden does not produce fruit at the moment. According to our guide, the last fruit trees were dug out thirty years ago. It is only in recent years that a renovation programme started to be implemented, aimed at recreating the orchard to its authentic original features. During our visit to Kroměříž, Moravia, Czech Republic. One of the fields once planted with fruit trees. Photo Karl Strasser, 7 October 2017. Another part of the Kroměříž orchard, recently replanted. Photo Karl Strasser, 7 October 2017. 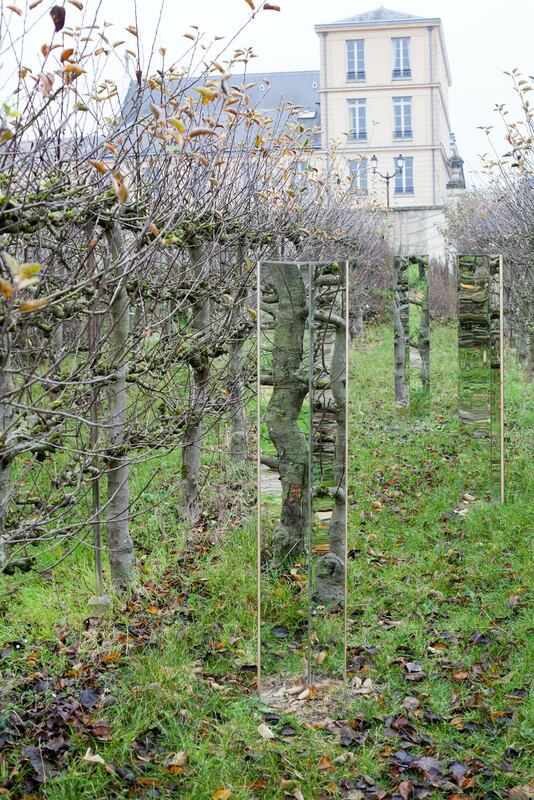 Thousands of trees produce fruit in the ‘Potager du Roi’, France. Photo 2 December 2017. Kiwis and persimmons grown and sold at the Potager. Photo 2 December 2017. Pear jams made with fruit grown in the Potager. Photo 4 December 2017. 17th century orchards renovation projects: looking behind or ahead? Both Kroměříž and Versailles palaces are listed as UNESCO World Heritage Sites, and their orchards need renovation. My view is that the renovation projects will probably be conducted in very different ways. 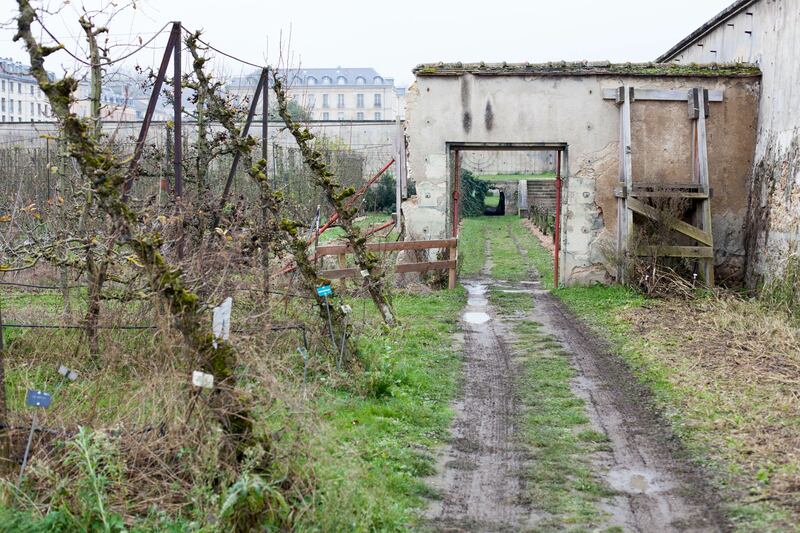 The drainage system at the ‘Potager du Roi’ and some of the walls should be rebuilt, and many trees should be replaced. Photo 2 December 2017. The aim here is to recreate the orchard as it was in the 17th century. To that end, we, Europom 2017 delegates, were invited to contribute to a workshop held at Kroměříž palace on 7 October 2017 as part of the above-mentioned technical studies. For instance, I had carried out research before the workshop and drew the shapes and dimensions of trained trees recommended in the French horticultural treatises of the time, which must have been read by the designers of the original orchard in Kroměříž. 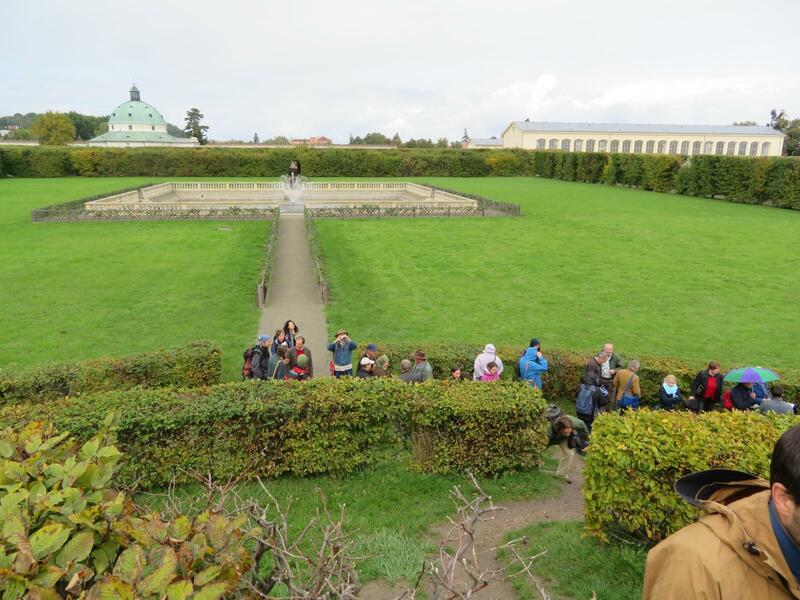 Apart from the question of the cultivars to be grown, which could include varieties with better tasting qualities developed after the 17th century, it was clear from that workshop that the aim of this orchard renovation project was conservation indeed, recreating a past environment for the Kroměříž Palace and Gardens’ museum visitors to enjoy. The fact that the project is managed by the Czech National Heritage Institute with special funding from the Ministry of Culture ‘allocated to the conservation of the immovable cultural heritage’, as stated in the UNESCO World Heritage website3, confirms this positioning. 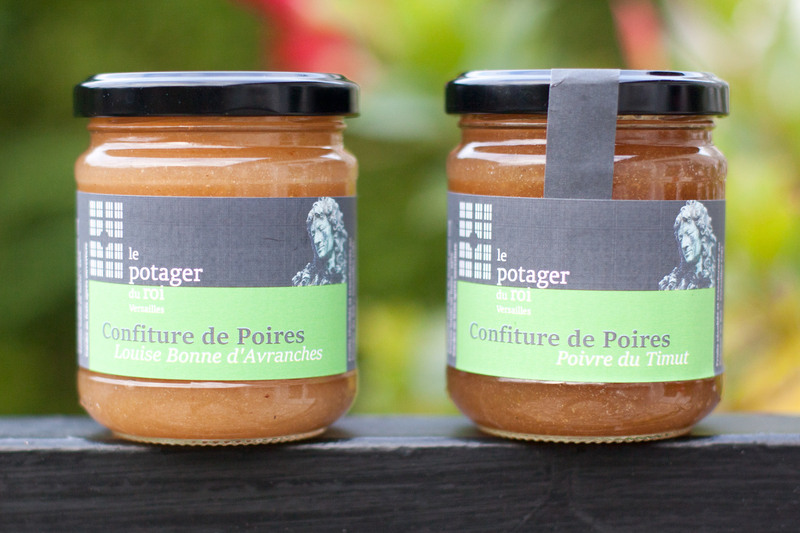 The ‘Potager du Roi’: experimentation and innovation at the forefront? The case of the Potager du Roi is quite different. 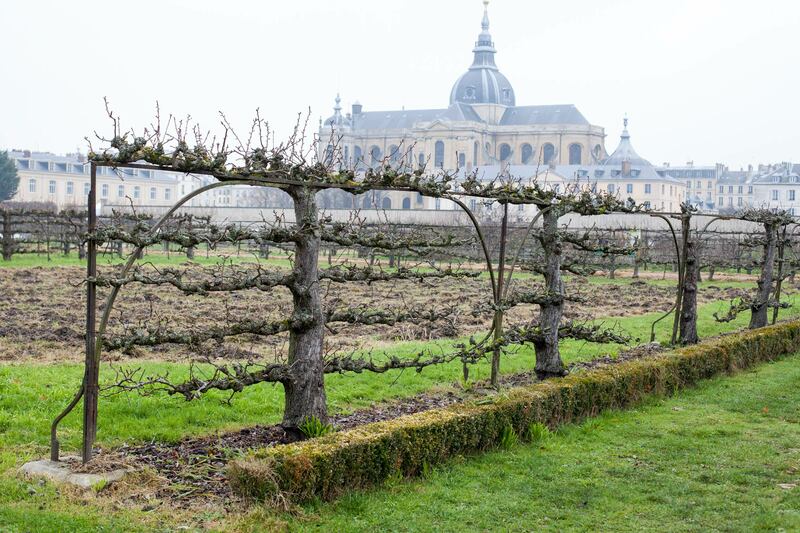 The king’s kitchen garden is part of the UNESCO World Heritage Site of Versailles. However, it is not managed by the Palace of Versailles itself, a museum supervised by the French Ministry of Culture and Communication. It is run by a school, the ‘Ecole Nationale Supérieure du Paysage’4 (French National School of Landscape Architecture), a place where students may learn about the conservation of heritage sites but are also equipped with the skills to design all kinds of new landscapes. The school is supervised by the Ministry of Agriculture. This Ministry, currently trying to deal with the challenges of industrial farming while looking at opportunities for the development of new highly productive techniques such as permaculture, has an opportunity to carry out research at the ‘Potager du Roi’, pursuing the garden’s long tradition of innovation and experimentation. This research could be particularly useful in relation to consumer demand for shorter food-sourcing solutions through urban and peri-urban farming. The project could also be seen to address the value of solidarity, dear to the French Minister of State for the ‘Transition Ecologique et Solidaire’ Nicolas Hulot (French Minister of the environment). We may find out that regenerating the ‘Potager du Roi’ is not only about refurbishing the drainage system, walls and other damaged features, nor aiming at experimenting with agro-ecological techniques, but also about putting enough human resources in place so that gardeners and other contributors to the daily life of the Potager can work effectively to fulfil a common ambition for the site. A well-resourced team experimenting with innovative agro-ecological methods for the production of top quality food aimed at local distribution in urban areas, does that sound like an interesting perspective for the regeneration of the ‘Potager du Roi’? Anyway, this is definitely looking ahead at the future of the place and its utility in society. I will leave the reader with a simple question. If you were a king wanting to eat the best pear, what would you go for? A GMO pear immune to a particular pesticide used to fight disease in the orchard or a pear grown pesticide-free in a nourishing soil rich of its self-regenerating biodiversity? In a place like the ‘Potager du Roi’, aimed at ‘serving the tastes of the monarch’ as Jean-Baptiste de la Quintinie wrote it in his horticultural treatise published in 1690, how should we produce? What would Louis XIV have liked best? And, as there is no more king, what would the people of France, of whom he was the most eminent figure, like now? I was pleased to learn yesterday that agro-ecology was one of the four themes chosen by the team set up to plan for the renovation of the Potager as part of the 2018 World Monuments Watch initiative. 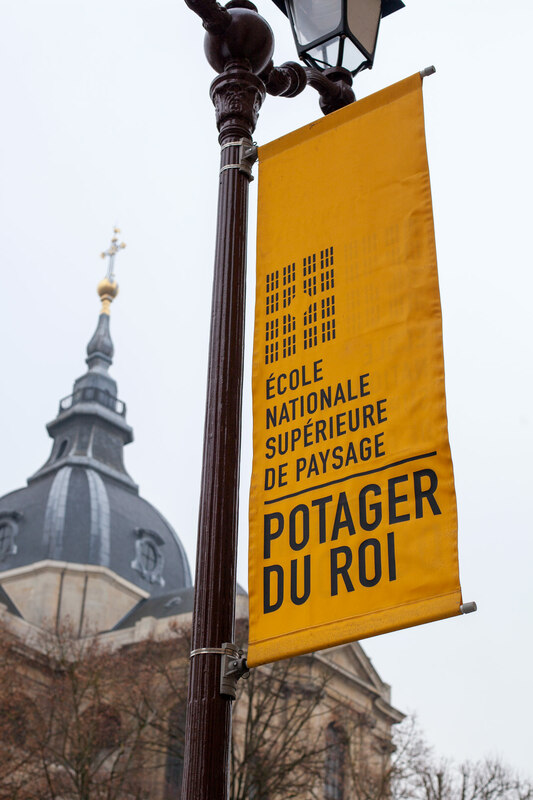 It sounds like a regeneration keeping the spirit of the ‘Potager du Roi’, what the historian, researcher and teacher at the Ecole Nationale Supérieure du Paysage Chiara Santini calls the ‘genius of the place’5, might be on its way. Let’s hope it will be a creative and successful one. Mirror, mirror, please tell me: which one is the most beautiful tree? The ‘Potager du Roi’, photo 2 December 2017. 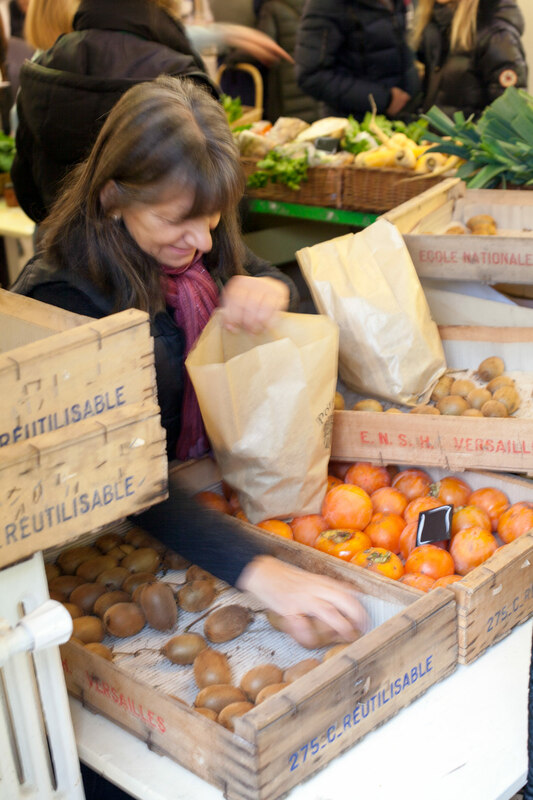 This entry was posted in Fruit for sustainable development and tagged France, Paris by Les Jardins d'ici. Bookmark the permalink.